To people working in the grassroots refugee response in Greece, Aslam needs no introduction. To those unfamiliar with his work, Aslam has begrudgingly allowed us to share his some of his inspiring story here, along with a call to support refugees observing Ramadan. 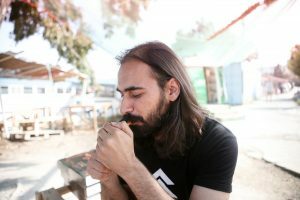 Help Refugees first met Aslam in Idomeni in Northern Greece. Border closures had created a huge informal refugee camp in the north of the country, made up of people whose journeys had been truncated by newly-built fences. Refugees here were living in flimsy festival tents, suffering in deep mud, with little-to-no access to food. We’ve heard Aslam described as the ‘godfather of the grassroots’, and watching him coordinate the volunteer response in Idomeni, it was easy to see why. It was here we started working with Aslam, providing desperately-needed emergency aid and services to the people in this region. Three years later, Aslam is still at the heart of our work in Greece. In typically matter-of-fact style, he declares that he doesn’t have any special motivation for helping. “If an old lady fell over in the street, you wouldn’t think about your motivation for helping her up. You’d just help her up”. But despite this reticence, fuelled entirely by a diet of Nescafé and Marlboro Reds, he’s achieved remarkable things. Typically understated about his own impact, we’d like to celebrate the hundreds of tonnes of food and millions of meals he’s ensured reach refugees, alongside the building projects he’s facilitated and the innumerable improvements to facilities in camps that he’s enabled. “Food is one of the biggest gaps here. Many people get food from the army, which isn’t good. Some get cash instead of food, but the cash really isn’t enough. So this isn’t only about Ramadan, people need help with food all the time. But during Ramadan, people are fasting so they need it more. “Sometimes people wonder, why would you still fast as a refugee? But if there was a war and people were from the UK became refugees, would you still have Christmas? Of course you would. There’s an unattributed quote we like, about the importance of building longer tables, not higher fences. Here we want to celebrate the work of our colleague and our friend, both for his big heart, his disturbingly dark sense of humour, and his drive to ensure everyone can have a place at the table. The Help Refugees family is large, caring, and at times, fairly unconventional. And we can say with absolute certainty that it wouldn’t be the same without Aslam. If you’re inspired by Aslam’s work, please donate to support his work providing food for refugees this Ramadan.